I have edited the Conferences, seminars and other public appearances/ page and extended the list of conferences I have attended in the past including many sessions. Topics covered in these sessions have been C#, Delphi, Databases, Linux, Kylix, debugging, Compact Framework, and much much more. Let me know which sessions you’d like to see online first. The list is far from complete, but it is another step into getting the list more accurate. Speaking @ BASTA! 2009 – .NET Everywhere!, September 21-25, 2009, Rheingoldhalle, Mainz, Germany on .NET gems, C#, WPF multi-media and much more. Masoud Kamali just notified that 2 of my sessions got accepted for the German BASTA! 2009 – .NET Everywhere! conference that is being held from September 21 til 25 in the Rheingoldhalle (which is in Mainz right in between the river Rhine and the city centre). With my blog posting last week on Delphi – class helper to add for … in support for TComponent.Components/ComponentCount I ‘lied’ a bit. This filters the enumeration to only enumerate components that are of type TSQLQuery or descend from type TSQLQuery. So I wanted to write a ‘richer’ enumerator than just iterating over all components. The scond part of the lie is that such an enumerator in fact already exists: there is already a TComponent.GetEnumerator method. Primoz Gabrijelcic’s – web/blog – rightly noted in the comment where he pointed to a similar blog post he wrote for TControls. Since I wrote this post last week as well, but scheduled to be published right before DelphiLive!, I just added a reference to his comment, site, blog and posting. TComponent already has a GetEnumerator since Delphi 2006. But my TComponentEnumerator was meant as a base class to show you how to descend from it. And that’s what this blog post is about. 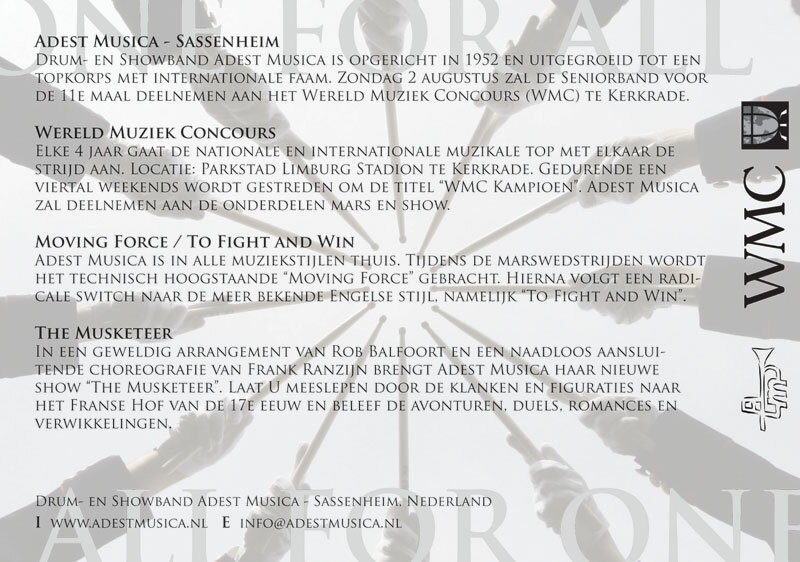 Menno de Jong created a paper flyer for the World Music Contest 2009 entry that our marching band Adest Musica is going to perform. Like the new truck on the right, it perfectly fits the theme “the Musketeer”, and reflects our journey to the WMC in Kerkrade. 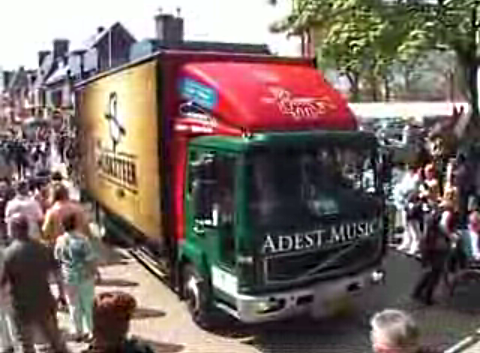 April 30 in Ede was part of that journey, and we regret that the release could not take place: the tattoo on which we would have performed got cancelled due to the attempted attack on the Royal Dutch Family that day. 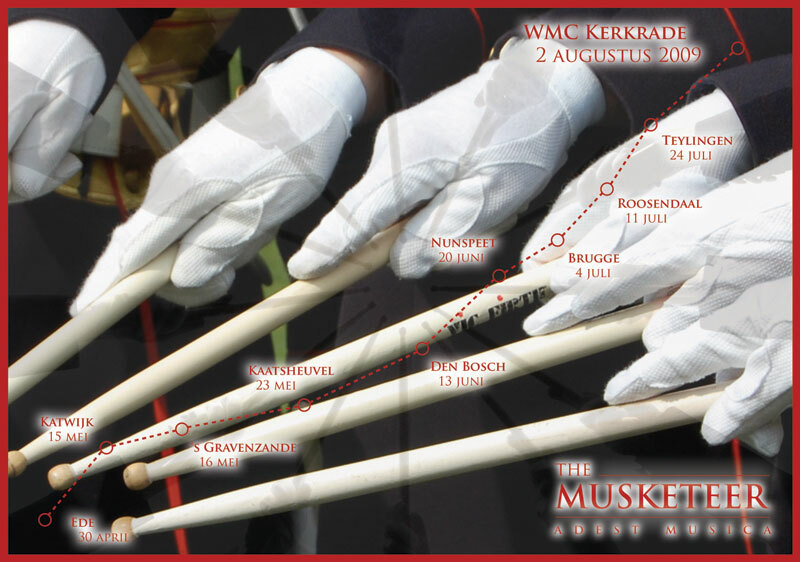 However, the parade in Ede that day did take place, so we were able to show the public our new marches.